Here at Pacqio we focus on producing well handled, friendly and even tempered animals of very high quality. 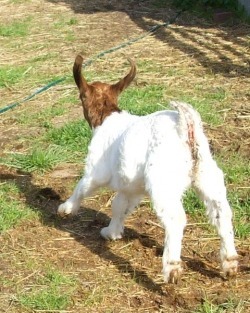 We specialise in starter herds for people just beginning to enter this wonderful world of goats and sheep. We have a range of breeds to suit your needs, and our animals range from high quality show animals, registered and unregistered breeders, and pets. We have Angora, Boer and Dairy goats, Damara sheep and traditional crossbred meat sheep. We also train some of our goats to work in harness and pull a cart, and carry a pack. Goats and sheep make fantastic pets; spend a few minutes walking through the paddocks with our animals and they will convince you of this! Spend some time looking around our website, there are plenty of photos for you to browse through, as well as information to help you learn more about our breeds of sheep and goats. Looking for cattle for small farms? We can help you find Murray Grey and Square Meaters cattle. Website last updated July 2009 All content remains the property of K. Muthsam, copyright 2009.